League members are getting together for night/glow golf at Heritage Creek Golf Course in Jamison. You need not be a league member to enter this event. 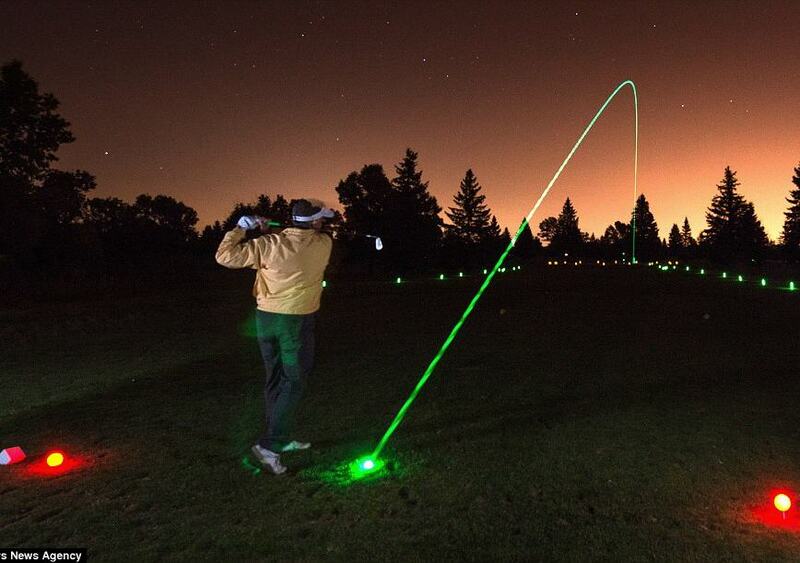 If you've never played night golf, you need to experience it at least once in your lifetime. It is a lot of fun. Registration was a little light last year. I think we had only 7 or 8 foursomes. If we can't get at least 10 foursomes this time around, the Glow Golf event will come to an end, at least as far as I am concerned. Cost: $50.00 per golfer, 9 holes (includes 2 glow balls) The regular price is $55.00. Heritage Golf is extending a $5.00 discount to our group. The course has glow sticks all over the place. The greens, flags, and cups are lit up. On contact, the ball lights for 10 minutes. Bounce it on the cart path, tee it up, and watch it like the 4th of July fireworks. It is pretty cool. This is not a competition. It is an exercise in having fun. Most play best ball (scramble). We played 2-man best ball within our foursome for a 5-spot. You can do whatever. We are limited to 12 foursomes and 12 foursomes only. PLEASE REGISTER AS A FOURSOME ONLY. Click the link below to register for Night/Glow Golf. Please register as a foursome ($200.00) and have the players in your group reimburse you. Once you register, please send me a list of the players in your foursome. There will be NO REFUNDS for this event. If the event is postponed on August 25th it will be rescheduled for September 15th. If you cannot make the rescheduled date, you will have the option of selling your spot to someone else or kissing your payment goodbye. Please do not remit any kind of payment to Heritage Creek Golf Course unless you wholeheartedly agree to abide by the rules and regulations as set forth by Heritage Creek Golf Club. Thus far a total of 3 foursomes have registered for glow golf. I know it's early, but I can't help but feel I got suckered into it this year. Last year's turnout was less than full. I wondered if maybe some of the glow golf luster had worn off. I wasn't going to do it this year until a bunch of people came to me at the field asking about it. I thought, "OK, let's do this". What put the SBA Winter Banquets, SBA Fishing Charter, and The Reading Phillies/Fireworks Bus Trip into extinction will do the same thing for the Glow Golf Outings. All talk, no do. Regardless of how many league members sign up, we can and will have the outing this year as schedule. I will simply tell Heritage to take us off the exclusive group list and open it up to anyone. If league members get shut out, oh well. So many people have mentioned to me they are ready, willing, and able to do the Glow Golf. Time is running out. If we don't show enough interest, the plug will get pulled. Now would be a good time to step up and remit your payment to Heritage Creek. You can't expect them to hold our spots if we don't show the interest. Interest can only be gauged by money. Talk is cheap. Les - can I open this up to some people I work with? Absolutely! It's always been open to anyone. The more the merrier. We have a total of 3 foursomes registered for night golf. If at least 5 foursomes don't step up and register by tomorrow afternoon (yeah right), night golf outings will become extinct just like the Winter Awards Banquet, SBA Fishing Charter, and Reading Phillies Bus Trips. Reason? Too many people are all talk and no do. We now have 6 foursomes. We need 2 more foursomes by tomorrow morning to make this happen. There is a registered foursome that only has 3 golfers and could use a 4th. If you are interested in joining as a single, let me know ASAP. In fact, if 4 singles join, we could make a free agent foursome. If you want in as a single, send me an email ASAP. I regret to inform you that we have decided to cancel the SBA Glow Golf Outing scheduled for the 25th of August. We couldn't get the commitment from enough golfers in the time frame we needed. There is more to these glow golf outings then a standard outing and due to that the ordering has to be placed earlier. Without hitting the minimum number of golfers, we have cancelled the outing. Everyone now has two options: 1. I can move your group to one of our remaining general public outings (August 31st or Octobers 6th) and still honor the discounted price that you paid, or 2. I can refund your money in full. Obviously we would rather move you to another outing so that you still get to play in a glow golf outing, but if they don't work for your schedule I will gladly refund your money. Thank you for committing and registering for the outing, and thank you Les for putting it together. Hopefully we can work up enough SBA golfers to host another outing in the future.